Watch the Metro Art: Rebeca Méndez Time-Lapse Video on LA Metro YouTube channel. Méndez selected to create a site-specific, integrated artwork for the Crenshaw/LAX Line project. The commission is for two tile murals, one measuring 10 × 96 fee and the other 16 × 15 feet. 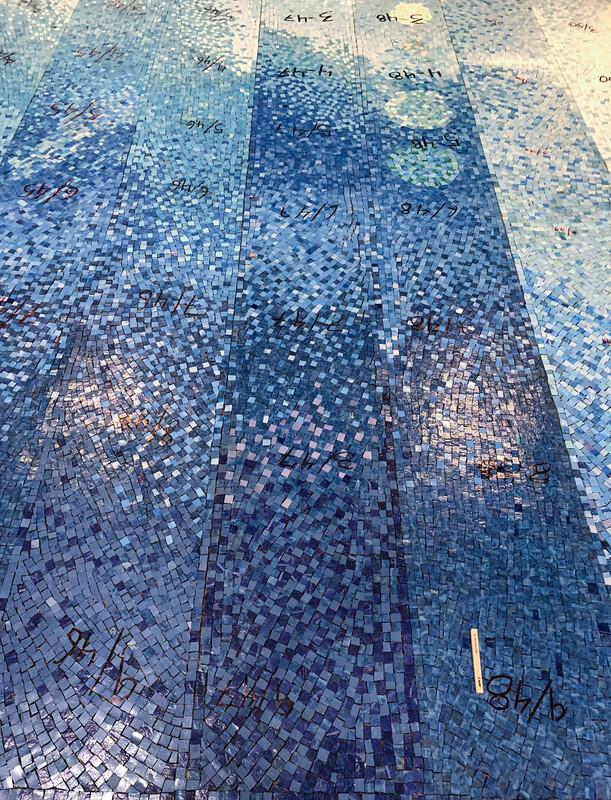 Titled At the Same Time, Rebeca Méndez’s mosaic mural concept for the concourse of this station portrays the diurnal rhythms of Los Angeles. 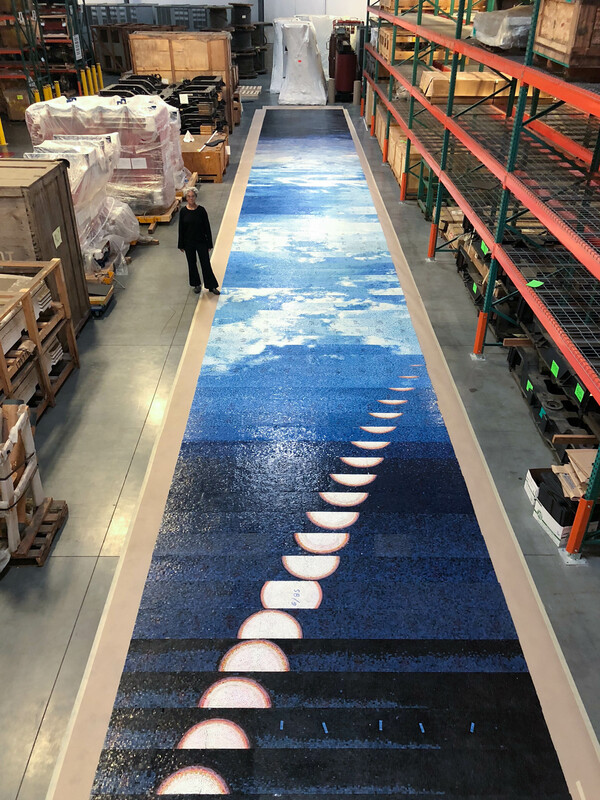 In preparation for this artwork, the artist photographed the Los Angeles sky over the course of several days and nights in the winter of 2015, during Southern California’s precious rainy season. At each session, Mendez captured one frame every 15 minutes, resulting in 96 moments of atmospheric time. The sequence in the proposed design portrays one of these days in early March. Images of the stars and the path of a moon flank brilliant blue skies scattered with a variety of clouds, typical of a March day in Southern California and a reminder of the value of water. The images also reflect Los Angeles’s favorable climate, which boasts an average of 292 days of full-and-partial sunshine per year. From sundials to water clocks, humans have long devised ways to measure the passage of time. Méndez’s diagram—to be produced with shimmering blue, grey and white tiles—intends to offer transit users a moment of respite from the artificial construct of time that dominates their days as they commute, work, play and sleep. At the Same Time can be understood as … [an] emotional timepiece … inspiring us to bring our mind and body as we experience, if just for a moment, the fullness of time expressed in the sky above us.